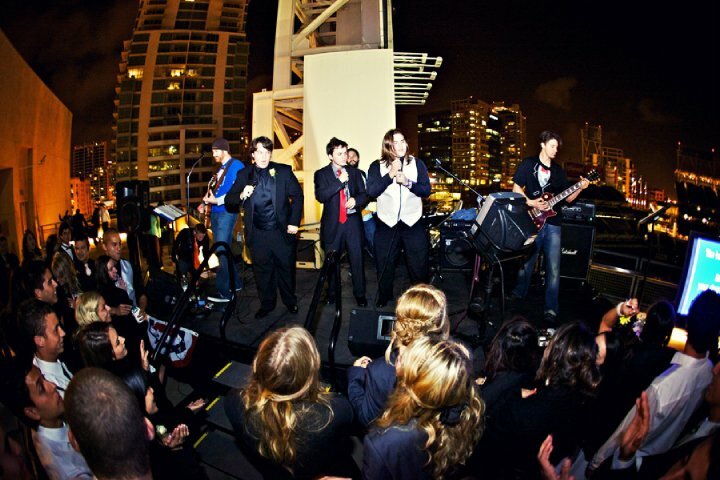 When Petco Park first approached us about playing for a high school prom, we were a bit apprehensive. After all, we’re a bunch of old guys and there is no Justin Bieber, Lady Gaga, or Ke$ha on our song list. Still, we’ll do anything for the kids, so why not? We agreed to rock the prom to the best of our collective abilities and the planning was on. 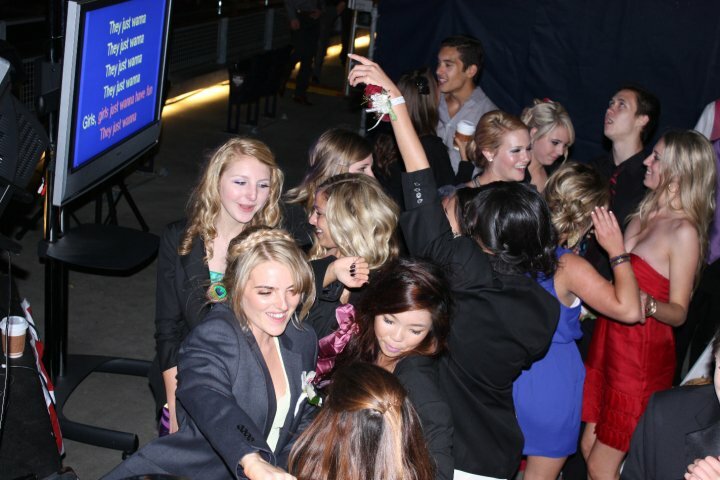 This wasn’t an ordinary prom (however, I’m not really sure I’m qualified to determine what a “normal” prom would be. Mine was in a gym. With a gravel parking lot. In small town Texas. With 70 of my closest friends. But I digress). Petco really knows how to throw a party! Pool tables, foosball, air hockey, a magician, and of course, gourmet ball park dogs! The setting was quite spectacular. Perched on top of the Western Metal Building at Petco Park, we had incredible views of downtown, East Village, Coronado, and of course, left field. The kids showed up around 7pm and we weren’t scheduled to take the mound until about 9. We hid in the shadows until after dark and took the stage just before 9. We didn’t have any singers ready to rock with the live band, so we kinda just solicited a kid from the crowd. Such a brave soul that Matthew was – to be the first to take the stage in front of 200+ of his classmates, by himself, with a live rock band, and literally knock The Cure’s ‘Just Like Heaven’ out of the park (pun intended)! The rest is history. From the moment we started playing, the set list filled with names and great tunes. This was the night of the duet, with most singers opting to bring a friend (or two) on stage. The kids genuinely had a great time and they were all so polite! Of course, leave it to us to forget about one song with questionable content, which of course was about the 4th song chosen. I hid behind my mic stand for most of that one. Overall, we had a killer time and most importantly, we think the kids did too. They all wanted this thing to go into extra innings. As an added bonus, we got some really killer photos from the evening taken by CCHS’ own, Bobby Brown. Yes, that’s his name, and no, he didn’t come up and sing ‘Don’t Be Cruel.’ Check out Bobby’s awesome photos below or on his website/blog (which also happens to have it’s own iPhone app!). Congratulations to the graduating seniors of Calvary Chapel HS and thanks for making the drive down to San Diego to sing karaoke with us. Special thanks to Petco Park (Allie, Stephanie, Andrew and the crew) and everyone else who made the night possible. While I’m not sure how many of the attendees were rounding second base later that night, I’d have to say this prom was definitely a home run.